Fast forward to modern day, and these once fancy feasts have really taken on a new style. While some remain within the traditional vain of the original supper club series, others, like Fodder, delve into the actual food, educating our eating choices, pop-up style. 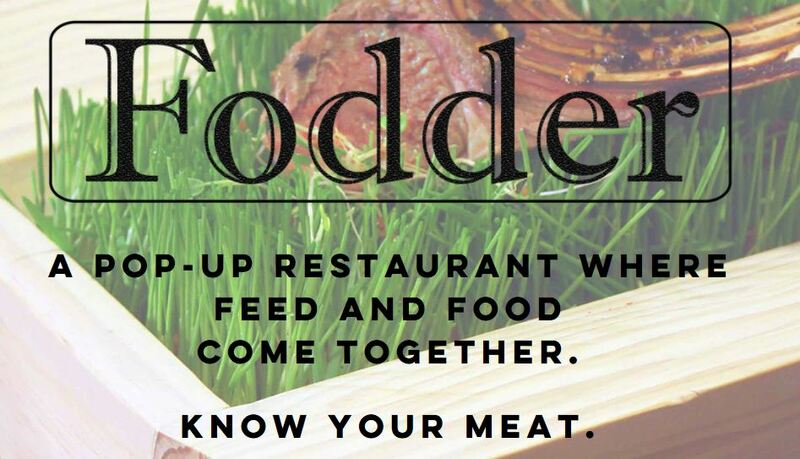 Fodder, founded by food designer Misha Volf, is an exclusive, gourmet meal experience, tracing the life of a pasture raised beef cow, through its diet. Think “You are what you eat”! That’s right, Volf helps you understand what buzzwords like “grass fed beef” really mean, and shows you what a different experience it is to eat when the animal you’re eating has been treated and fed well. Misha understands that typically, and especially in a culinary capital like New York City, food is a medium made to make statements. But he wants it to be more than that, he wants his guests to really understand that what and how we eat is intimately connected to how our food is made. The meal will be equal parts functional and fabulous, as it will be hosted in a private loft space in Brooklyn. The menu, created by Chef Aimee Hunter of Los Angeles, will include three courses consisting of fine meats, cheeses and produce served on a beautifully designed rustic, communal feeding basin, as Misha will explain each dish. Oh, and let’s not forget that of course there will be wine pairings along the way from upstate New York. For more info on this first of its kind (and fabulous) event, or to purchase tickets, please visit www.fodder.nyc.